Another long ravine through the Grapevine Mountains of northeast Death Valley, Grey Wall bears no official name but is surrounded by crumbling, twisted, layered rocks similar to those found around more well known canyons like Titus, Fall and Red Wall, and which here are predominantly grey-blue in color. It is not quite as deep or narrow as these other canyons further south and is a little more difficult to reach, yet is equal in tranquility and the stark beauty of the surroundings. Grey Wall Canyon is the first major drainage south of Grapevine Canyon, which is home to Scotty's Castle and provides the northern entrance route into Death Valley National Park, via road CA 267. 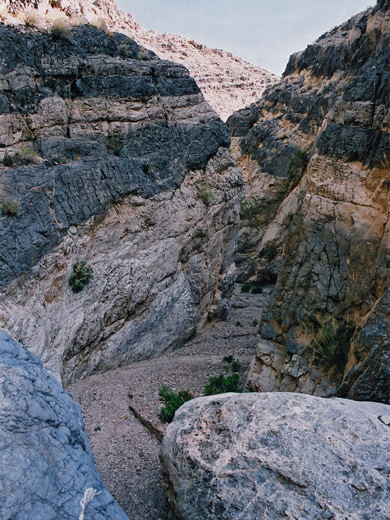 This turns southeast after the ranger station, staying level for 1.5 miles then bends to the south and descends towards the middle of the valley, crossing the dry wash that emerges from the end of Grey Wall Canyon about 3.5 miles after the side road to the Mesquite Spring Campground. A hike to the narrows can start either by walking directly up the streamway - the longest but easiest option - or walking cross-country beginning from the bend in the road. This is about a mile shorter though the terrain is quite uneven, with several steep, branched ravines to be crossed. No permit is required - just a standard Death Valley National Park entry fee, payable at the Furnace Creek visitor center, or during the cooler months, at the northern entrance station. 6 views of Grey Wall Canyon. TopoQuest topographic map of Grey Wall Canyon. 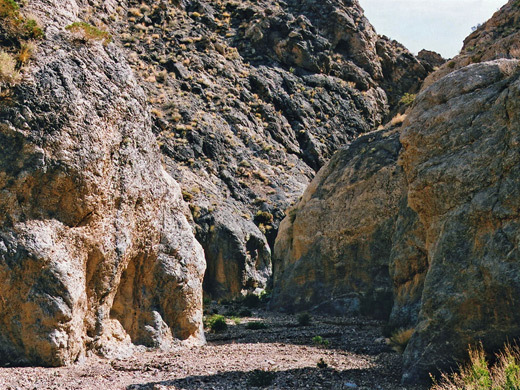 For 4 miles upstream from the park road, the creek bed is wide and stony, filled with large banks of pebbles and boulders washed down from the mountains above, and bordered by low dusty hills dotted with straggly bushes and occasional cacti. Then the cliffs begin to rise, forming a canyon, as the creek penetrates further into the Grapevine Mountains after having gained just over 1,000 feet in elevation since the road. The streamway continues to ascend steadily but gently, with no dryfalls, and eventually constricts, becomes more rocky and enters the first of several short slot-like passages, shallow though quite pretty, formed of alternating whitish grey and brown layers. Some of the walls are worn smooth by the seasonal floods, and in places the canyon floor contains 'chutes' where the waters have polished a course down bare rock. The cliffs and hillsides above are also mainly greyish and contain strata at various angles, all rather worn and weathered - in fact the whole scene has a distinct air of tiredness, the colors rather muted, as if in response to the harsh desert environment. The canyon splits after half a mile of narrows; the right branch seems not so interesting while the left is still initially narrow then widens soon after. It takes between 2 and 3 hours to reach this fork in the drainage.